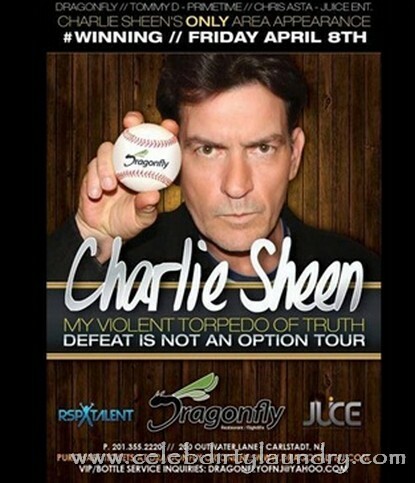 As we all know when Charlie Sheen has regular parties lots of cocaine, prostitutes, and mayhem are in attendance. So when Charlie plans a WILD party nobody can envisage the resulting horrible and unlawful activities that will take place. Well Charlie is planning a wild after party when his tour hits New York City next week and cops in the area are already calling for back up! Even though Charlie’s show is at Radio City Music Hall in NYC, the post celebration is in the tiny town of Carlstadt, NJ, population around 6,000, where they usually only have 3 officers on duty per shift. Heck, Charlie’s crack dealers alone need at least 3 cops in pursuit. Charlie plans on making the Dragonfly nightclub in Carlstadt the hub of his post performance party and the Carlstadt PD says they’ll ratchet things up and put about 10 officers on the night shift. Despite reserving the extra officers police say they don’t anticipate anything more than crowd control and traffic issues. Is that police-speak for a riot – or do the officers hope that Charlie will leave the worst of himself on stage and get off rather tired and ready for bed?